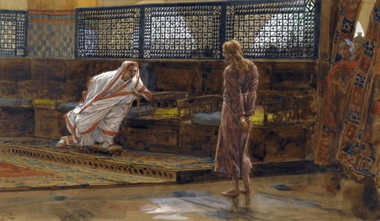 James Tissot, Jesus before Pilate, First Interview, 19th century. Pilate comes near the end of the story of Jesus. Whatever Gospel you’re reading, by the time you arrive at Pilate’s palace, you’ve already gotten a pretty good idea of who Jesus is. You’ve seen him heal with compassion. You’ve seen him go out of his way to include people that most would have written off. Maybe what you see turns you off, or maybe it thrills your soul. Either way, you know what he offers and—more important—you know what he asks of those who would follow him. Enter Pilate. Pilate is something of an enigma in the Gospels. Was he a wishy-washy politician only concerned with public opinion? Was he a ruthless manipulator who knew exactly what he wanted to gain from this encounter, not only with Jesus but also with Jesus’ accusers? Most interpreters lean strongly toward the former, and that is certainly the picture the Synoptic Gospels paint. Pilate knows that there is no substance to the charges against Jesus. He is no more a political revolutionary than the man in the moon. And yet, the Jerusalem religious elites could make trouble for Pilate. They had in the past. The crowd, stirred up by those same chief priests and elders, clamor for Jesus’ death. Amazingly, frustratingly, Jesus remains silent. Since Pilate cannot conceive of any other way to extricate himself from the situation, he orders Jesus’ death. • If Pilate believed Jesus was innocent, why didn’t he stand up to the Jerusalem authorities? • What might Pilate have hoped to gain by ordering Jesus’ crucifixion? Did he succeed? Explain. • What might Pilate have feared to lose by letting Jesus go? • When have you been tempted to let someone else make an important decision? • What might we fear losing by taking a stand with Jesus? Evaluation of Pilate’s career has been both negative and positive. The Jewish sources represent Pilate negatively. Philo wrote that the conduct of his office was marked by corruption, violence, ill-treatment, and numerous illegal executions. Philo and Josephus record instances of the offense of Jewish traditions by Pilate. He was the first procurator of Judea to use pagan religious symbols on coins. Roman standards bearing the emperor’s image were brought into Jerusalem and votive shields inscribed with the emperor’s name were placed in the royal palace. Pilate used Temple funds to build an aqueduct, and his forces quelled what he erroneously thought was a revolt by Samaritans, killing and capturing some of them. The massacre of Samaritans causes such a reaction that Pilate was summoned to Rome. Christians consider his condemnation of Jesus to be Pilate’s greatest misjudgment. The NT presents Pilate as reluctantly condemning Jesus (Mark 15:12-15; Luke 23:13-24; Matt 27:22-24; John 19:12-15), and the Jews as taking the blame (Matt 27:25). Current interpretations of these accounts include the view that Christianity was embarrassed by the tradition which blamed Pilate for Jesus’ death, and that as the church spread westward it shifted the blame onto the Jewish people. Also, Pilate is defended by the claim that his decision as recorded in Matthew, Mark, and Luke fit well into the Roman legal framework. Without any defense by Jesus himself, Pilate has no option but to convict him. It is also pointed out that since Tiberius kept Pilate in office for ten years, he must have found no serious fault in his administration. Philip R. Hart, “Pilate,” Mercer Dictionary of the Bible, ed. Watson E. Mills et al. (Macon GA: Mercer University Press, 1990), 690. Pilate sits while Jesus stands before him in v. 11, and he asks Jesus point blank, “Are you the king of the Jews?” Jesus responds without hesitation, “you said it” or “that’s what you just said,” but in any case it amounts to an affirmation. The Greek does not merely mean “Those are just your words.” Our Evangelist is intent on portraying Jesus as a king. Presumably Pilate had been prepped on the charge against Jesus. Here is where we note that claiming to be a messianic figure was not quite identical to claiming to be a king. Pilate’s question is about the more political of the two claims, the one that could result in a conviction for high treason, since only Caesar or one of his client kings could claim to be ruler; and in Judea there were no longer any client kings, so only Caesar was king in an imperial province like Judea. The high priests and elders begin making various accusations, but Jesus is silent and gives no answer. Pilate is surprised and so asks Jesus if he does not hear the testimonies being brought against him, but again Jesus does not dignify false charges with an answer—he remains silent, not responding even to a single charge, to the great amazement of Pilate. Pilate was used to people groveling, being highly defensive, or being clever rhetorically, but stony silence amazed him. Something was wrong with these proceedings. Jesus’ silence may have caused the Evangelist’s audience to remember the description in Isaiah 53:7-9. Here, nearing the end of this Gospel, we have a Gentile ruler wondering greatly at the silent Christ just as near the beginning of the story Gentile great ones, the magi, rejoiced. Notice that they, like Pilate, will receive warning in a dream about foul play. Jesus is a king to be recognized and is supposed to be revered, even by Gentiles. Our author makes the connections necessary so that the portrayal of Jesus as a royal figure is clear from start to finish in this Gospel. Ben Witherington III, Matthew, Smyth & Helwys Bible Commentary (Macon GA: Smyth & Helwys, 2006), 508–509.